This is an elegant handmade sterling silver and turquoise cuff. The center piece measures 15/16" x 1 1/16". 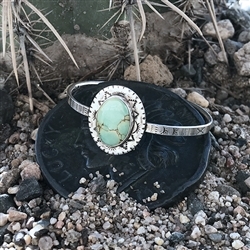 The cuff band is 3/16" wide and features southwestern stamping. Feel free to email us or call us with any questions!